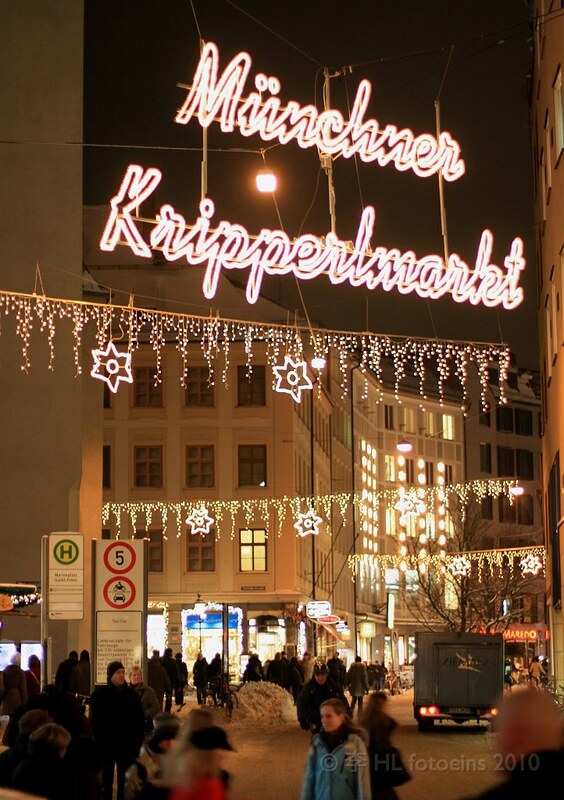 With two weeks to Christmas (10 Dec 2010), I’m continuing my series on Christmas Markets, which will eventually take me to Frankfurt am Main, Berlin, and Prague. 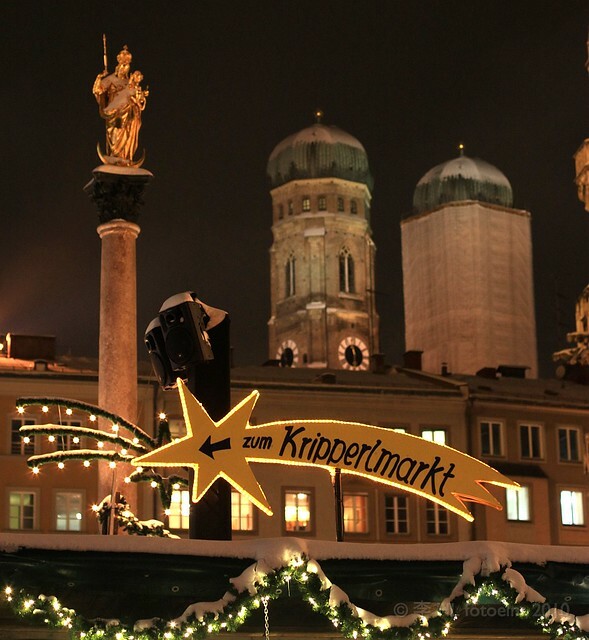 One of the main and most popular Christmas markets in the Bavarian state capital is found in the Altstadt (Old Town) at Marienplatz. 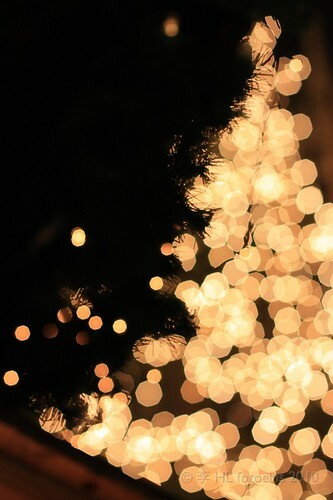 The market here is spread out in front of the Neues Rathaus, and this year’s giant of a Christmas tree hails from Garmisch-Partenkirchen, if the signs nailed to the trunk are true. 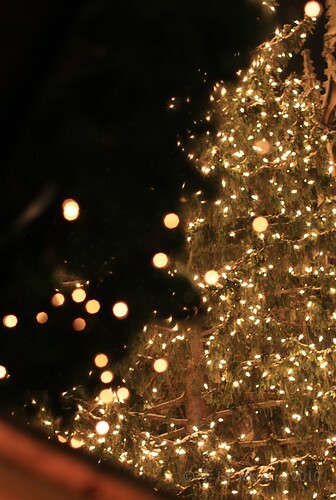 There are stalls offering Christmas decorations and tree ornaments; candied hearts with declarations of love (“ich liebe dich”); scarves, hats, and mitts for bipeds or quadrupeds; roasted nuts; grilled steak or, of course, the humble Bratwurst; fried potato pancakes; and the ubiquitous Glühwein. 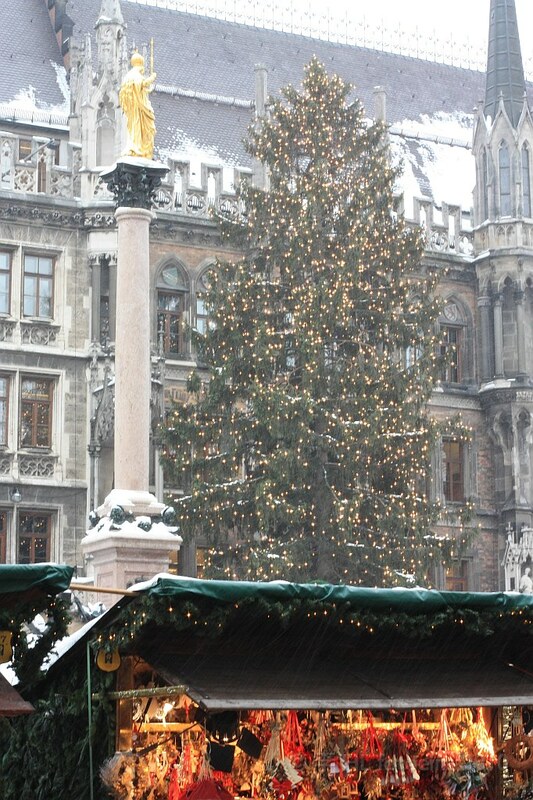 Glühwein (mulled wine) is heated red-wine with spices, e.g., cloves, citrus, cinnamon, sugar, etc. 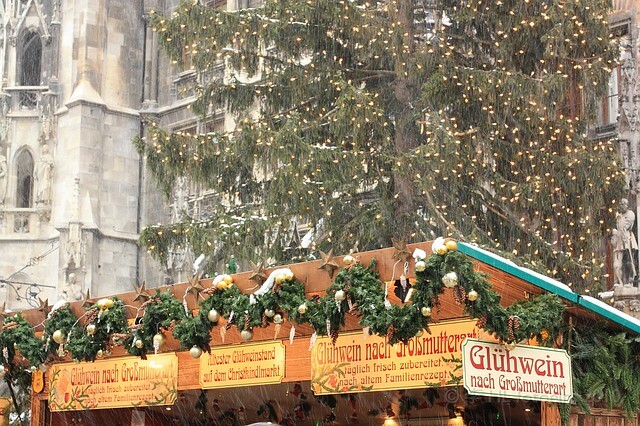 At any given Christmas market, Glühwein can be had from any number of countless stalls. 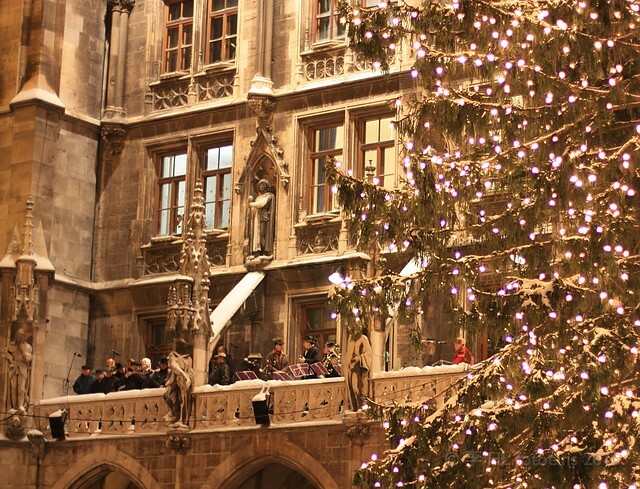 You can often order Glühwein “mit Schuss”, which is an extra shot of rum or liqueur. Not only do you pay for the Glühwein, there’s also a modest deposit for the mug in which the hot grog is served. After finishing your drink, you can keep the mug as a souvenir of your visit to the market, or you can return the mug from the original booth or stall and get your deposit back. It’s easy to see how over time your cabinets become filled with Glühwein mugs which change annually and can be different from one market to another (or even, one stall to another). Over a number of sessions were a few Glühwein and a few Wurst consumed (or destroyed), as far as I can remember. Walking through the markets at any time day or night can be problematic, if one stumbles into the market either hungry or cold with the warm delicious smells of food and drink wafting through the air. But rest assured that with a few euros jangling in your pocket waiting to be freed, it’s always good to know the invitation to consume and partake is always open. 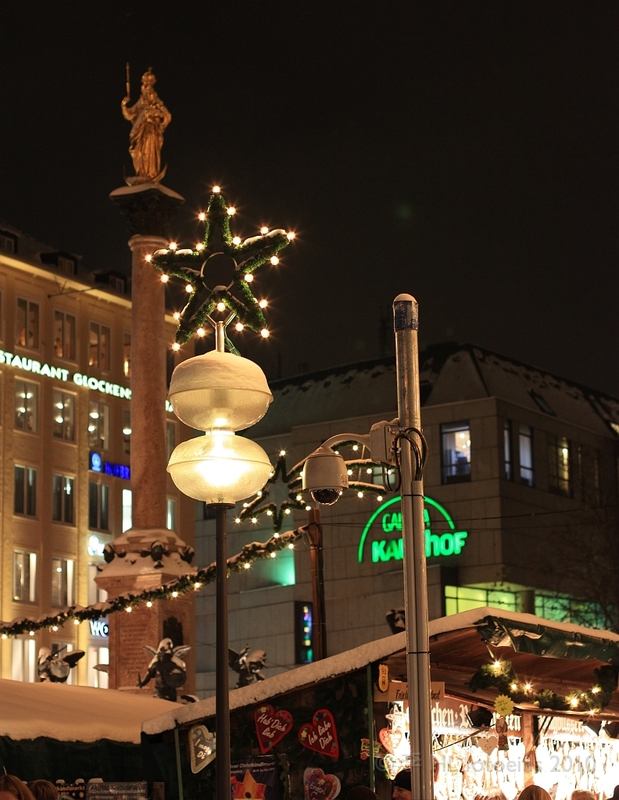 Photos above were made at Munich’s Marienplatz with the Canon EOS450D camera and the EF 50mm f/1.4 USM lens. Appearing initially on Posterous on 10 Dec 2010, this post has moved and now appears on Fotoeins Fotopress (fotoeins.com). Thanks, Andrea; I think you’re going to enjoy the Christmas markets!